Adams Oshiomhole, national chairman of the All Progressives Congress (APC), says Senate President Bukola Saraki will be “buried politically” by February 2019. He said this in reaction to the APC’s victory in the bye-election conducted on Saturday in Kwara, the senate president’s home state. Speaking on Wednesday in Abuja, the APC chairman said: “They went on to say that Oshiomhole should vacate office, that I have no moral right to morality. “Now in his own case, the people of Kwara wouldn’t give him the honour of resigning. They are going to politically bury him come February next year and he has seen the first warning signal. He mocked Saraki for being unable to help his party win the bye-election despite being the leader of the Peoples Democratic Party (PDP). “Here is a native doctor who busy going to another state but unable to heal is own people in his own state. 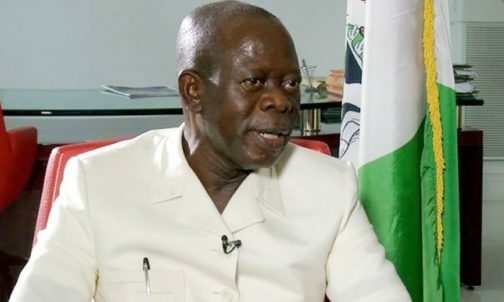 That defeat in Kwara is more outstanding,” Oshiomhole said. The former Edo governor said since the inception of the national working committee of the APC which he heads, the party has not lost any major election. He said: “We reviewed the recent elections and we are proud to be able to say that since the new national working committee was elected on the 24th of June 2018, since I came on board along with my brothers and sisters of NWC, we are proud that we have not lost any major election. “We have done rerun election in Katsina and we have won twice. We did another one Saturday and we won again. We had a rerun in Bauchi for senate, we won.